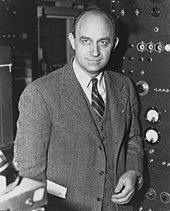 Fermi's name is linked because of a casual conversation he had in the Summer of 1950 with fellow physicists Edward Teller, Herbert York, and Emil Konopinski. While walking to lunch, the men happened to discuss recent UFO reports, a humorous cartoon, and the possibility of faster-than-light travel. The conversation moved on to other topics, until during lunch Fermi suddenly said, "Where are they?" (Teller's remembrance), or alternatively "Don't you ever wonder where everybody is?" (York's remembrance), or alternatively "But where is everybody?" (Konopinski's remembrance). There have been many attempts to explain the Fermi paradox, primarily either suggesting that intelligent extraterrestrial beings are extremely rare or proposing reasons that such civilizations have not contacted or visited Earth. The first aspect of the Fermi paradox is a function of the scale or the large numbers involved: there are an estimated 200–400 billion stars in the Milky Way (2–4 × 1011) and 70 sextillion (7×1022) in the observable universe. Even if intelligent life occurs on only a minuscule percentage of planets around these stars, there might still be a great number of extant civilizations, and if the percentage were high enough it would produce a significant number of extant civilizations in the Milky Way. This assumes the mediocrity principle, by which the Earth is a typical planet. The Fermi paradox can be asked in two ways. The first is, "Why are no aliens or their artifacts found here on Earth, or in the Solar System?" If interstellar travel is possible, even the "slow" kind nearly within the reach of Earth technology, then it would only take from 5 million to 50 million years to colonize the galaxy. This is relatively brief on a geological scale, let alone a cosmological one. Since there are many stars older than the Sun, and since intelligent life might have evolved earlier elsewhere, the question then becomes why the galaxy has not been colonized already. Even if colonization is impractical or undesirable to all alien civilizations, large-scale exploration of the galaxy could be possible by probes. These might leave detectable artifacts in the Solar System, such as old probes or evidence of mining activity, but none of these have been observed. The second form of the question is "Why do we see no signs of intelligence elsewhere in the universe?" This version does not assume interstellar travel, but includes other galaxies as well. For distant galaxies, travel times may well explain the lack of alien visits to Earth, but a sufficiently advanced civilization could potentially be observable over a significant fraction of the size of the observable universe. Even if such civilizations are rare, the scale argument indicates they should exist somewhere at some point during the history of the universe, and since they could be detected from far away over a considerable period of time, many more potential sites for their origin are within range of our observation. It is unknown whether the paradox is stronger for our galaxy or for the universe as a whole. In the summer of 1950, while working at Los Alamos National Laboratory, Fermi had a casual conversation while walking to lunch with colleagues Emil Konopinski, Edward Teller and Herbert York. The conversation began with a discussion of a recent spate of UFO reports and the possibility of extraterrestrial life. Konopinski remembered mentioning a recent Alan Dunn cartoon which showed aliens stealing New York City trash cans. He wrote, "More amusing was Fermi's comment, that it was a very reasonable theory since it accounted for two separate phenomena: the reports of flying saucers as well as the disappearance of the trash cans." Teller remembered Fermi asking him, "Edward, what do you think. How probable is it that within the next ten years we shall have clear evidence of a material object moving faster than light?" Teller said, "10^-6" (one in a million). Fermi said, "This is much too low. The probability is more like ten percent." Teller wrote that this was "the well known figure for a Fermi miracle." The conversation shifted to other subjects, until during lunch Fermi suddenly exclaimed, "Where are they?" (Teller's remembrance), or "Don't you ever wonder where everybody is?" (York's remembrance), or "But where is everybody?" (Konopinski's remembrance). Two of out three remember Fermi's exclamation being related to the previous conversation. A different two out of three remember immediately knowing that Fermi was referring to extraterrestrials. Teller remembers "approximately eight" persons sitting at the lunch table; York and Konopinski remember just the three of them plus Fermi. Teller and Konopinski remembered the previous conversation about UFO sightings and the possibility of faster-than-light travel. However, York did not, and wrote, "Somehow (and perhaps it was connected to the prior conversation in the way you describe, even though I do not remember that) we all knew he meant extra-terrestrials." But Konopinski does not seem to have drawn the connection or to have done so only more vaguely, with him writing, "It was his way of putting it that drew laughs from us." Teller did draw the connection, and wrote, "The result of his question was general laughter because of the strange fact that in spite of Fermi's question coming from the clear blue, everybody around the table seemed to understand at once that he was talking about extraterrestrial life." As far as how the conversation then continued, York remembers that Fermi "followed up with a series of calculations on the probability of earthlike planets, the probability of life given an earth, the probability of humans given life, the likely rise and duration of high technology, and so on. He concluded on the basis of such calculations that we ought to have been visited long ago and many times over." Teller remembers that not much came of this conversation "except perhaps a statement that the distances to the next location of living beings may be very great and that, indeed, as far as our galaxy is concerned, we are living somewhere in the sticks, far removed from the metropolitan area of the galactic center." Fermi died of cancer in 1954. However, in letters to the three surviving men decades later in 1984, Dr. Eric Jones of Los Alamos was able to partially put the original conversation back together. He informed each of the men that he wished to include a reasonably accurate version or composite in the written proceedings he was putting together for a previously-held conference entitled "Interstellar Migration and the Human Migration." Fermi was not the first to ask the question. An earlier implicit mention was by Konstantin Tsiolkovsky in an unpublished manuscript from 1933. He noted "people deny the presence of intelligent beings on the planets of the universe" because "(i) if such beings exist they would have visited Earth, and (ii) if such civilizations existed then they would have given us some sign of their existence." This was not a paradox for others, who took this to imply the absence of ETs. But it was one for him, since he believed in extraterrestrial life and the possibility of space travel. Therefore, he proposed what is now known as the zoo hypothesis and speculated that mankind is not yet ready for higher beings to contact us. That Tsiolkovsky himself may not have been the first to discover the paradox is suggested by his above-mentioned reference to other people's reasons for denying the existence of extraterrestrial civilizations. In 1975, Michael H. Hart published a detailed examination of the paradox, which has since become a theoretical reference point for much of the research into what is now sometimes known as the Fermi–Hart paradox. Geoffrey A. Landis prefers that name on the grounds that "while Fermi is credited with first asking the question, Hart was the first to do a rigorous analysis showing that the problem is not trivial, and also the first to publish his results". Robert H. Gray argues that the term Fermi paradox is a misnomer, since in his view it is neither a paradox nor due to Fermi; he instead prefers the name Hart–Tipler argument, acknowledging Michael Hart as its originator, but also the substantial contribution of Frank J. Tipler in extending Hart's arguments. Other names closely related to Fermi's question ("Where are they?") include the Great Silence, and silentium universi (Latin for "silence of the universe"), though these only refer to one portion of the Fermi Paradox, that we see no evidence of other civilizations. The theories and principles in the Drake equation are closely related to the Fermi paradox. The equation was formulated by Frank Drake in 1961 in an attempt to find a systematic means to evaluate the numerous probabilities involved in the existence of alien life. The speculative equation considers the rate of star formation in the galaxy; the fraction of stars with planets and the number per star that are habitable; the fraction of those planets that develop life; the fraction that develop intelligent life; the fraction that have detectable, technological intelligent life; and finally the length of time such communicable civilizations are detectable. The fundamental problem is that the last four terms are completely unknown, rendering statistical estimates impossible. The Drake equation has been used by both optimists and pessimists, with wildly differing results. The first scientific meeting on the search for extraterrestrial intelligence (SETI), which had 10 attendees including Frank Drake and Carl Sagan, speculated that the number of civilizations was roughly numerically equal to the lifetime[clarify] in years, and there were probably between 1,000 and 100,000,000 civilizations in the Milky Way galaxy. Conversely, Frank Tipler and John D. Barrow used pessimistic numbers and speculated that the average number of civilizations in a galaxy is much less than one. Almost all arguments involving the Drake equation suffer from the overconfidence effect, a common error of probabilistic reasoning about low-probability events, by guessing specific numbers for likelihoods of events whose mechanism is not yet understood, such as the likelihood of abiogenesis on an Earth-like planet, with current likelihood estimates varying over many hundreds of orders of magnitude. An analysis that takes into account some of the uncertainty associated with this lack of understanding has been carried out by Anders Sandberg, Eric Drexler and Toby Ord, and suggests that, with very high probability, either intelligent civilizations are plentiful in our galaxy or humanity is alone in the observable universe, with the lack of observation of intelligent civilizations pointing towards the latter option. The Great Filter, in the context of the Fermi paradox, is whatever prevents "dead matter" from giving rise, in time, to expanding, lasting life according to the Kardashev scale. The most commonly agreed-upon low probability event is abiogenesis: a gradual process of increasing complexity of the first self-replicating molecules by a randomly occurring chemical process. Other proposed great filters are the emergence of eukaryotes or of meiosis or some of the steps involved in the evolution of a brain capable of complex logical deductions. There are two parts of the Fermi paradox that rely on empirical evidence—that there are many potential habitable planets, and that we see no evidence of life. The first point, that many suitable planets exist, was an assumption in Fermi's time that is gaining ground with the discovery of many exoplanets, and models predicting billions of habitable worlds in our galaxy. The second part of the paradox, that we see no evidence of extraterrestrial life, is also an active field of scientific research. This includes both efforts to find any indication of life, and efforts specifically directed to finding intelligent life. These searches have been made since 1960, and several are ongoing. Although astronomers do not usually search for extraterrestrials, they have observed phenomena that they could not immediately explain without positing an intelligent civilization as the source. For example, pulsars, when first discovered in 1967, were called little green men (LGM) because of the precise repetition of their pulses. In all cases, explanations with no need for intelligent life have been found for such observations, but the possibility of discovery remains. Proposed examples include asteroid mining that would change the appearance of debris disks around stars, or spectral lines from nuclear waste disposal in stars. An ongoing example is the unusual transit light curves of star KIC 8462852, where natural interpretations are not fully convincing. Although most likely a natural explanation will emerge, some scientists are investigating the remote possibility that it could be a sign of alien technology, such as a Dyson swarm. Radio technology and the ability to construct a radio telescope are presumed to be a natural advance for technological species, theoretically creating effects that might be detected over interstellar distances. The careful searching for non-natural radio emissions from space may lead to the detection of alien civilizations. Sensitive alien observers of the Solar System, for example, would note unusually intense radio waves for a G2 star due to Earth's television and telecommunication broadcasts. In the absence of an apparent natural cause, alien observers might infer the existence of a terrestrial civilization. 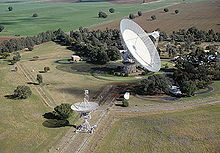 It should be noted however that the most sensitive radio telescopes currently available on Earth would not be able to detect non-directional radio signals even at a fraction of a light-year, so it is questionable whether any such signals could be detected by an extraterrestrial civilization. Such signals could be either "accidental" by-products of a civilization, or deliberate attempts to communicate, such as the Arecibo message. A number of astronomers and observatories have attempted and are attempting to detect such evidence, mostly through the SETI organization. Several decades of SETI analysis have not revealed any unusually bright or meaningfully repetitive radio emissions. Exoplanet detection and classification is a very active sub-discipline in astronomy, and the first possibly terrestrial planet discovered within a star's habitable zone was found in 2007. New refinements in exoplanet detection methods, and use of existing methods from space (such as the Kepler Mission, launched in 2009) are starting to detect and characterize Earth-size planets, and determine if they are within the habitable zones of their stars. Such observational refinements may allow us to better gauge how common potentially habitable worlds are. Self-replicating probes could exhaustively explore a galaxy the size of the Milky Way in as little as a million years. If even a single civilization in the Milky Way attempted this, such probes could spread throughout the entire galaxy. Another speculation for contact with an alien probe—one that would be trying to find human beings—is an alien Bracewell probe. Such a hypothetical device would be an autonomous space probe whose purpose is to seek out and communicate with alien civilizations (as opposed to Von Neumann probes, which are usually described as purely exploratory). These were proposed as an alternative to carrying a slow speed-of-light dialogue between vastly distant neighbors. Rather than contending with the long delays a radio dialogue would suffer, a probe housing an artificial intelligence would seek out an alien civilization to carry on a close-range communication with the discovered civilization. The findings of such a probe would still have to be transmitted to the home civilization at light speed, but an information-gathering dialogue could be conducted in real time. Direct exploration of the Solar System has yielded no evidence indicating a visit by aliens or their probes. Detailed exploration of areas of the Solar System where resources would be plentiful may yet produce evidence of alien exploration, though the entirety of the Solar System is vast and difficult to investigate. Attempts to signal, attract, or activate hypothetical Bracewell probes in Earth's vicinity have not succeeded. In 1959, Freeman Dyson observed that every developing human civilization constantly increases its energy consumption, and, he conjectured, a civilization might try to harness a large part of the energy produced by a star. He proposed that a Dyson sphere could be a possible means: a shell or cloud of objects enclosing a star to absorb and utilize as much radiant energy as possible. Such a feat of astroengineering would drastically alter the observed spectrum of the star involved, changing it at least partly from the normal emission lines of a natural stellar atmosphere to those of black-body radiation, probably with a peak in the infrared. 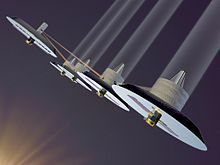 Dyson speculated that advanced alien civilizations might be detected by examining the spectra of stars and searching for such an altered spectrum. There have been some attempts to find evidence of the existence of Dyson spheres that would alter the spectra of their core stars. Direct observation of thousands of galaxies has shown no explicit evidence of artificial construction or modifications. In October 2015, there was some speculation that a dimming of light from star KIC 8462852, observed by the Kepler Space Telescope, could have been a result of Dyson sphere construction. However, around 2018, observations determined that the amount of dimming varied by the frequency of the light, pointing to dust, rather than an opaque object such as a Dyson sphere, as the culprit for causing the dimming. Those who think that intelligent extraterrestrial life is (nearly) impossible argue that the conditions needed for the evolution of life—or at least the evolution of biological complexity—are rare or even unique to Earth. Under this assumption, called the rare Earth hypothesis, a rejection of the mediocrity principle, complex multicellular life is regarded as exceedingly unusual. In his book Wonderful Life (1989), Stephen Jay Gould suggested that if the "tape of life" were rewound to the time of the Cambrian explosion, and one or two tweaks made, human beings most probably never would have evolved. On the other hand, other thinkers such as Fontana, Buss, and Kauffman have written about the self-organizing properties of life. It is possible that even if complex life is common, intelligence (and consequently civilizations) is not. While there are remote sensing techniques that could perhaps detect life-bearing planets without relying on the signs of technology, none of them has any ability to tell if any detected life is intelligent. This is sometimes referred to as the "algae vs. alumnae" problem. Life on Earth has existed for 4 billion years, but intelligent life has only arisen with the genus Homo about 3 million years ago. For most of its existence, Earth was a wild planet. If other uninhabited planets developed similarly to Earth, they are more likely not to bear intelligent life yet. It may be that while alien species with intelligence exist, they are primitive or have not reached the level of technological advancement necessary to communicate. Along with non-intelligent life, such civilizations would be also very difficult for us to detect, short of a visit by a probe, a trip that would take hundreds of thousands of years with current technology. To skeptics, the fact that in the history of life on the Earth only one species has developed a civilization to the point of being capable of spaceflight and radio technology lends more credence to the idea that technologically advanced civilizations are rare in the universe. David Brin states, "It turns out that our Earth skates the very inner edge of our sun’s continuously habitable — or 'Goldilocks' — zone. And the Earth may be anomalous. It may be that because we are so close to our sun, we have an anomalously oxygen-rich atmosphere, and we have anomalously little ocean for a water world. In other words, 32 percent continental mass may be high among water worlds. "In which case, the evolution of creatures like us, with hands and fire and all that sort of thing, may be rare in the galaxy. In which case, when we do build starships and head out there, perhaps we’ll find lots and lots of life worlds, but they’re all like Polynesia. We’ll find lots and lots of intelligent lifeforms out there, but they’re all dolphins, whales, squid, who could never build their own starships. What a perfect universe for us to be in, because nobody would be able to boss us around, and we’d get to be the voyagers, the Star Trek people, the starship builders, the policemen, and so on." Another hypothesis is that an intelligent species beyond a certain point of technological capability will destroy other intelligent species as they appear, perhaps by using self-replicating probes. Science fiction writer Fred Saberhagen has explored this idea in his 'Berserker' series, as has physicist Gregory Benford. A species might undertake such extermination out of expansionist motives, greed, paranoia, or aggression. In 1981, cosmologist Edward Harrison argued that such behavior would be an act of prudence: an intelligent species that has overcome its own self-destructive tendencies might view any other species bent on galactic expansion as a threat. It has also been suggested that a successful alien species would be a superpredator, as are humans. Another possibility invokes the "tragedy of the commons" and the anthropic principle: the first lifeform to achieve interstellar travel will necessarily (even if unintentionally) prevent competitors arising, and humans simply happen to be first. New life might commonly die out due to runaway heating or cooling on their fledgling planets. On Earth, there have been numerous major extinction events that destroyed the majority of complex species alive at the time; the extinction of the dinosaurs is the best known example. These are thought to have been caused by events such as impact from a large meteorite, massive volcanic eruptions, or astronomical events such as gamma-ray bursts. It may be the case that such extinction events are common throughout the universe and periodically destroy intelligent life, or at least its civilizations, before the species is able to develop the technology to communicate with other intelligent species. Using extinct civilizations such as Easter Island as models, a study conducted in 2018 posited that climate change induced by "energy intensive" civilizations may prevent sustainability within such civilizations, thus explaining the paradoxical lack of evidence for intelligent extraterrestrial life. Cosmologist Alan Guth proposed a multiverse solution to the Fermi paradox. This hypothesis uses the synchronous gauge probability distribution, with the result that young universes exceedingly outnumber older ones (by a factor of e1037 for every second of age). Therefore, averaged over all universes, universes with civilizations will almost always have just one, the first to develop. However, Guth notes "Perhaps this argument explains why SETI has not found any signals from alien civilizations, but I find it more plausible that it is merely a symptom that the synchronous gauge probability distribution is not the right one." It may be that non-colonizing technologically capable alien civilizations exist, but that they are simply too far apart for meaningful two-way communication. If two civilizations are separated by several thousand light-years, it is possible that one or both cultures may become extinct before meaningful dialogue can be established. Human searches may be able to detect their existence, but communication will remain impossible because of distance. It has been suggested that this problem might be ameliorated somewhat if contact/communication is made through a Bracewell probe. In this case at least one partner in the exchange may obtain meaningful information. Alternatively, a civilization may simply broadcast its knowledge, and leave it to the receiver to make what they may of it. This is similar to the transmission of information from ancient civilizations to the present, and humanity has undertaken similar activities like the Arecibo message, which could transfer information about Earth's intelligent species, even if it never yields a response or does not yield a response in time for humanity to receive it. It is also possible that archaeological evidence of past civilizations may be detected through deep space observations. A related speculation by Sagan and Newman suggests that if other civilizations exist, and are transmitting and exploring, their signals and probes simply have not arrived yet. However, critics have noted that this is unlikely, since it requires that humanity's advancement has occurred at a very special point in time, while the Milky Way is in transition from empty to full. This is a tiny fraction of the lifespan of a galaxy under ordinary assumptions, so the likelihood that we are in the midst of this transition is considered low in the paradox. Some SETI skeptics may also believe that we are at a very special point of time. Specifically, that we are in a transitional period from no space-faring societies to one space-faring society, namely that of human beings. It is possible, however, that present scientific knowledge cannot properly gauge the feasibility and costs of such interstellar colonization. Theoretical barriers may not yet be understood, and the resources needed may be so great as to make it unlikely that any civilization could afford to attempt it. Even if interstellar travel and colonization are possible, they may be difficult, leading to a colonization model based on percolation theory. Colonization efforts may not occur as an unstoppable rush, but rather as an uneven tendency to "percolate" outwards, within an eventual slowing and termination of the effort given the enormous costs involved and the expectation that colonies will inevitably develop a culture and civilization of their own. Colonization may thus occur in "clusters", with large areas remaining uncolonized at any one time. Most colonization scenarios would involve a center core living on home planets and the expanding outer circle. This outer circle (or sphere until the width of the galaxy is reached) may have been space-faring for some time, and might be physically, psychologically, and in other ways adapted to life in space. Of course, space-faring ETs would still need resources, and thus may devour planets in greedy fashion or may follow an ethic of respect for "Nursery Worlds" without feeling that they are in competition for the high rent real estate. If human-capability constructs in a machine such as mind uploading are possible, and it is possible to transfer such constructs over vast distances and rebuild on a remote machine, then it might not make a strong economic sense to travel the galaxy by spaceflight. After the first civilization have physically explored or colonized the galaxy, as well as sent such machines for easy explorations, then the subsequent civilizations, after having contacted the first, may find it cheaper, faster, and easier to explore the galaxy through intelligent construct transfers to the machines built by the first civilization, which is cheaper than spaceflight by a factor of 108-1017. However, since a star system needs only one such remote machine, and the communication is most likely highly directed, transmitted at high-frequencies and at a minimal power to be economical, such signals would be hard to detect from earth. Humanity's ability to detect intelligent extraterrestrial life has existed for only a very brief period—from 1937 onwards, if the invention of the radio telescope is taken as the dividing line—and Homo sapiens is a geologically recent species. The whole period of modern human existence to date is a very brief period on a cosmological scale, and radio transmissions have only been propagated since 1895. Thus, it remains possible that human beings have neither existed long enough nor made themselves sufficiently detectable to be found by extraterrestrial intelligence. There are some assumptions that underlie the SETI programs that may cause searchers to miss signals that are present. Extraterrestrials might, for example, transmit signals that have a very high or low data rate, or employ unconventional (in our terms) frequencies, which would make them hard to distinguish from background noise. Signals might be sent from non-main sequence star systems that we search with lower priority; current programs assume that most alien life will be orbiting Sun-like stars. The greatest challenge is the sheer size of the radio search needed to look for signals (effectively spanning the entire observable universe), the limited amount of resources committed to SETI, and the sensitivity of modern instruments. SETI estimates, for instance, that with a radio telescope as sensitive as the Arecibo Observatory, Earth's television and radio broadcasts would only be detectable at distances up to 0.3 light-years, less than 1/10 the distance to the nearest star. A signal is much easier to detect if the signal energy is limited to either a narrow range of frequencies, or directed at a specific part of the sky. Such signals could be detected at ranges of hundreds to tens of thousands of light-years distance. However, this means that detectors must be listening to an appropriate range of frequencies, and be in that region of space to which the beam is being sent. Many SETI searches assume that extraterrestrial civilizations will be broadcasting a deliberate signal, like the Arecibo message, in order to be found. It may be that alien civilizations are detectable through their radio emissions for only a short time, reducing the likelihood of spotting them. The usual assumption is that civilizations outgrow radio through technological advancement. However, even if radio is not used for communication, it may be used for other purposes such as power transmission from solar power satellites. Such uses may remain visible even after broadcast emission are replaced by less observable technology. More hypothetically, advanced alien civilizations may evolve beyond broadcasting at all in the electromagnetic spectrum and communicate by technologies not developed or used by mankind. Some scientists have hypothesized that advanced civilizations may send neutrino signals. If such signals exist, they could be detectable by neutrino detectors that are now under construction for other goals. It has been suggested that some advanced beings may divest themselves of physical form, create massive artificial virtual environments, transfer themselves into these environments through mind uploading, and exist totally within virtual worlds, ignoring the external physical universe. It may also be that intelligent alien life develops an "increasing disinterest" in their outside world. Possibly any sufficiently advanced society will develop highly engaging media and entertainment well before the capacity for advanced space travel, and that the rate of appeal of these social contrivances is destined, because of their inherent reduced complexity, to overtake any desire for complex, expensive endeavors such as space exploration and communication. Once any sufficiently advanced civilization becomes able to master its environment, and most of its physical needs are met through technology, various "social and entertainment technologies", including virtual reality, are postulated to become the primary drivers and motivations of that civilization. In response to Tipler's idea of self-replicating probes, Stephen Jay Gould wrote, "I must confess that I simply don’t know how to react to such arguments. I have enough trouble predicting the plans and reactions of the people closest to me. I am usually baffled by the thoughts and accomplishments of humans in different cultures. I’ll be damned if I can state with certainty what some extraterrestrial source of intelligence might do." Of course, it is possible that a minority are dedicated colonizers, but that an assortment of other factors have prevented this relatively small number from reaching Earth. Another possibility is that human theoreticians have underestimated how much alien life might differ from that on Earth. Aliens may be psychologically unwilling to attempt to communicate with human beings. Perhaps human mathematics is parochial to Earth and not shared by other life, though others argue this can only apply to abstract math since the math associated with physics must be similar (in results, if not in methods). Physiology might also cause a communication barrier. Carl Sagan speculated that an alien species might have a thought process orders of magnitude slower (or faster) than ours. A message broadcast by that species might well seem like random background noise to us, and therefore go undetected. Another thought is that technological civilizations invariably experience a technological singularity and attain a post-biological character. Hypothetical civilizations of this sort may have advanced drastically enough to render communication impossible. Alien civilizations might be technically capable of contacting Earth, but are only listening instead of transmitting. If all, or even most, civilizations act the same way, the galaxy could be full of civilizations eager for contact, but everyone is listening and no one is transmitting. This is the so-called SETI Paradox. The only civilization we know, our own, does not explicitly transmit, except for a few small efforts. Even these efforts, and certainly any attempt to expand them, are controversial. It is not even clear we would respond to a detected signal—the official policy within the SETI community is that "[no] response to a signal or other evidence of extraterrestrial intelligence should be sent until appropriate international consultations have taken place." However, given the possible impact of any reply it may be very difficult to obtain any consensus on "Who speaks for Earth?" and "What should we say?" The zoo hypothesis states that intelligent extraterrestrial life exists and does not contact life on Earth to allow for its natural evolution and development. This hypothesis may break down under the uniformity of motive flaw: all it takes is a single culture or civilization to decide to act contrary to the imperative within our range of detection for it to be abrogated, and the probability of such a violation increases with the number of civilizations. Analysis of the inter-arrival times between civilizations in the galaxy based on common astrobiological assumptions suggests that the initial civilization would have a commanding lead over the later arrivals. As such, it may have established what we call the zoo hypothesis through force or as a galactic/universal norm and the resultant "paradox" by a cultural founder effect with or without the continued activity of the founder. It is possible that a civilization advanced enough to travel between solar systems could be actively visiting or observing Earth while remaining undetected or unrecognized. A related idea to the zoo hypothesis is that, beyond a certain distance, the perceived universe is a simulated reality. The planetarium hypothesis speculates that beings may have created this simulation so that the universe appears to be empty of other life. A significant fraction of the population believes that at least some UFOs (Unidentified Flying Objects) are spacecraft piloted by aliens. While most of these are unrecognized or mistaken interpretations of mundane phenomena, there are those that remain puzzling even after investigation. The consensus scientific view is that although they may be unexplained, they do not rise to the level of convincing evidence. Similarly, it is theoretically possible that SETI groups are not reporting positive detections, or governments have been blocking signals or suppressing publication. This response might be attributed to security or economic interests from the potential use of advanced extraterrestrial technology. It has been suggested that the detection of an extraterrestrial radio signal or technology could well be the most highly secret information that exists. Claims that this has already happened are common in the popular press, but the scientists involved report the opposite experience—the press becomes informed and interested in a potential detection even before a signal can be confirmed. Regarding the idea that aliens are in secret contact with governments, David Brin writes, "Aversion to an idea, simply because of its long association with crackpots, gives crackpots altogether too much influence." ^ Krauthammer, C. (December 29, 2011). "Are we alone in the universe?". The Washington Post. Retrieved January 6, 2015. ^ Grevesse, N.; Noels, A.; Sauval, A. J. (1996). "Standard abundances". ASP Conference Series. 99. p. 117. Bibcode:1996ASPC...99..117G. The Sun is a normal star, though dispersion exists. ^ Chris Impe (2011). The Living Cosmos: Our Search for Life in the Universe. Cambridge University Press. ISBN 978-0-521-84780-3. , page 282. ^ Aguirre, V. Silva; G. R. Davies; S. Basu; J. Christensen-Dalsgaard; O. Creevey; T. S. Metcalfe; T. R. Bedding; et al. (2015). "Ages and fundamental properties of Kepler exoplanet host stars from asteroseismology". Monthly Notices of the Royal Astronomical Society. 452 (2): 2127–2148. arXiv:1504.07992. Bibcode:2015MNRAS.452.2127S. doi:10.1093/mnras/stv1388. Accepted for publication in MNRAS. See Figure 15 in particular. ^ Schilling, G. (June 13, 2012). "ScienceShot: Alien Earths Have Been Around for a While". Science. Retrieved January 6, 2015. ^ Buchhave, L. A.; et al. (June 21, 2012). "An abundance of small exoplanets around stars with a wide range of metallicities". Nature. 486 (7403): 375–7. Bibcode:2012Natur.486..375B. doi:10.1038/nature11121. PMID 22722196. ^ a b c Hart, Michael H. (1975). "Explanation for the Absence of Extraterrestrials on Earth". Quarterly Journal of the Royal Astronomical Society. 16: 128–135. Bibcode:1975QJRAS..16..128H. ^ a b c d e f g h i j "Where is everybody? 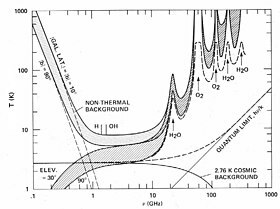 ": An account of Fermi's question", Dr. Eric M. Jones, Los Alamos Technical report LA-10311-MS, March 1985. ^ a b Overbye, Dennis (August 3, 2015). "The Flip Side of Optimism About Life on Other Planets". The New York Times. Retrieved October 29, 2015. ^ If the Universe Is Teeming with Aliens ... WHERE IS EVERYBODY? : Seventy-Five Soultions to the Fermi Paradox and the Problem of Extraterrestrial Life, Second Edition, Stephen Webb, foreword by Martin Rees, Heidelberg, New York, Dordrecht, London: Springer International Publishing, 2002, 2015. ^ Urban, Tim (June 17, 2014). "The Fermi Paradox". Huffington Post. Retrieved January 6, 2015. ^ Cain, Fraser (June 3, 2013). "How Many Stars are There in the Universe?". Universe Today. Retrieved May 25, 2016. ^ Craig, Andrew (July 22, 2003). "Astronomers count the stars". BBC News. Retrieved April 8, 2010. ^ See Hart for an example of "no aliens are here", and Webb for an example of the more general "We see no signs of intelligence anywhere". ^ a b Crawford, I.A., "Where are They? Maybe we are alone in the galaxy after all", Scientific American, July 2000, 38–43, (2000). ^ J. Richard Gott, III. "Chapter 19: Cosmological SETI Frequency Standards". In Zuckerman, Ben; Hart, Michael (eds.). Extraterrestrials; Where Are They?. Page 180. ^ Shostak, Seth (October 25, 2001). "Our Galaxy Should Be Teeming With Civilizations, But Where Are They?". Space.com. Space.com. Archived from the original on April 15, 2006. Retrieved October 14, 2014. ^ Alan Dunn (May 20, 1950). "Uncaptioned cartoon". The New Yorker. Retrieved August 19, 2010. ^ Tsiolkovsky, K, 1933, The Planets are Occupied by Living Beings, Archives of the Tsiolkovsky State Museum of the History of Cosmonautics, Kaluga, Russia. See original text in Russian Wikisource. ^ Lytkin, V.; Finney, B.; Alepko, L. (December 1995). "Tsiolkovsky – Russian Cosmism and Extraterrestrial Intelligence". Quarterly Journal of the Royal Astronomical Society. 36 (4): 369. Bibcode:1995QJRAS..36..369L. ^ Wesson, Paul (1990). "Cosmology, extraterrestrial intelligence, and a resolution of the Fermi-Hart paradox". Quarterly Journal of the Royal Astronomical Society. 31: 161–170. Bibcode:1990QJRAS..31..161W. ^ Landis, Geoffrey A. (1998). "The Fermi Paradox: An Approach Based on Percolation Theory". Journal of the British Interplanetary Society. 51 (5): 163–166. Bibcode:1998JBIS...51..163L. Retrieved June 12, 2016. ^ Gray, Robert H. (2015). "The Fermi paradox is neither Fermi's nor a paradox". Astrobiology. 15 (3): 195–199. arXiv:1605.09187. Bibcode:2015AsBio..15..195G. doi:10.1089/ast.2014.1247. ISSN 1531-1074. PMID 25719510. ^ a b "The 'Great Silence': The Controversy Concerning Extraterrestrial Intelligent Life", Quarterly Journal of the Royal Astronomical Society, Glen David Brin, Volume 24: pages 283–97, 3rd quarter of 1983 (received Sept. 1982). ^ James Annis (1999). "An Astrophysical Explanation for the Great Silence". arXiv:astro-ph/9901322. ^ Bostrom, Nick (2007). "In Great Silence there is Great Hope" (PDF). Retrieved September 6, 2010. ^ a b Milan M. Ćirković (2009). "Fermi's Paradox – The Last Challenge for Copernicanism?". Serbian Astronomical Journal. 178 (178): 1–20. arXiv:0907.3432. Bibcode:2009SerAJ.178....1C. doi:10.2298/SAJ0978001C. ^ Drake, F.; Sobel, D. (1992). Is Anyone Out There? The Scientific Search for Extraterrestrial Intelligence. Delta. pp. 55–62. ISBN 978-0-385-31122-9. ^ Barrow, John D.; Tipler, Frank J. (1988). The Anthropic Cosmological Principle. Oxford University Press. p. 588. ISBN 978-0-19-282147-8. LCCN 87028148. ^ Anders Sandberg; Eric Drexler; Toby Ord (June 6, 2018). "Dissolving the Fermi Paradox". arXiv:1806.02404 [physics.pop-ph]. ^ Hanson, Robin (1998). "The Great Filter — Are We Almost Past It?". Archived from the original on January 28, 2010. ^ Behroozi, Peter; Peeples, Molly S. (December 1, 2015). "On The History and Future of Cosmic Planet Formation". MNRAS. 454 (2): 1811–1817. arXiv:1508.01202. Bibcode:2015MNRAS.454.1811B. doi:10.1093/mnras/stv1817. ^ Sohan Jheeta (2013). "Final frontiers: the hunt for life elsewhere in the Universe". Astrophys Space Sci. 348 (1): 1–10. Bibcode:2013Ap&SS.348....1J. doi:10.1007/s10509-013-1536-9. ^ Wade, Nicholas (1975). "Discovery of pulsars: a graduate student's story". Science. 189 (4200). pp. 358–364. Bibcode:1975Sci...189..358W. doi:10.1126/science.189.4200.358. ^ Pulsars are now attributed to neutron stars, and Seyfert galaxies to an end-on view of the accretion onto the black holes. ^ "NASA/CP2007-214567: Workshop Report on the Future of Intelligence in the Cosmos" (PDF). NASA. Archived from the original (PDF) on August 11, 2014. ^ Duncan Forgan, Martin Elvis; Elvis (March 28, 2011). "Extrasolar Asteroid Mining as Forensic Evidence for Extraterrestrial Intelligence". International Journal of Astrobiology. 10 (4): 307–313. arXiv:1103.5369. Bibcode:2011IJAsB..10..307F. doi:10.1017/S1473550411000127. ^ Whitmire, Daniel P.; David P. Wright. (1980). "Nuclear waste spectrum as evidence of technological extraterrestrial civilizations". Icarus. 42 (1): 149–156. Bibcode:1980Icar...42..149W. doi:10.1016/0019-1035(80)90253-5. ^ Boyajian, T. S.; LaCourse, D. M.; Rappaport, S. A.; Fabrycky, D.; Fischer, D. A.; Gandolfi, D.; Kennedy, G. M.; Liu, M. C.; Moor, A.; Olah, K.; Vida, K.; Wyatt, M. C.; Best, W. M. J.; Ciesla, F.; Csak, B.; Dupuy, T. J.; Handler, G.; Heng, K.; Korhonen, H.; Kovacs, J.; Kozakis, T.; Kriskovics, L.; Schmitt, J. R.; Szabo, Gy. ; Szabo, R.; Wang, J.; Goodman, S.; Hoekstra, A.; Jek, K. J. (April 21, 2016). "Planet Hunters IX. KIC 8462852 – where's the flux?". MNRAS. 457 (4): 3988–4004. arXiv:1509.03622. Bibcode:2016MNRAS.457.3988B. doi:10.1093/mnras/stw218. ^ Ross Anderson (October 13, 2015). "The Most Mysterious Star in our Galaxy". The Atlantic. ^ Ian O'Neill (October 14, 2015). "Has Kepler Discovered an Alien Megastructure?". Discovery News. ^ Wright, Jason T.; Cartier, Kimberly M. S.; Zhao, Ming; Jontof-Hutter, Daniel; Ford, Eric B. (2015). "The Ĝ Search for Extraterrestrial Civilizations with Large Energy Supplies. IV. The Signatures and Information Content of Transiting Megastructures". The Astrophysical Journal. 816 (1): 17. arXiv:1510.04606. Bibcode:2016ApJ...816...17W. doi:10.3847/0004-637X/816/1/17. ^ Mullen, Leslie (2002). "Alien Intelligence Depends on Time Needed to Grow Brains". Astrobiology Magazine. Space.com. Archived from the original on February 12, 2003. Retrieved April 21, 2006. ^ Udry, S.; Bonfils, X.; Delfosse, X.; Forveille, T.; Mayor, M.; Perrier, C.; Bouchy, F.; Lovis, C.; Pepe, F.; Queloz, D.; Bertaux, J.-L. (2007). "The HARPS search for southern extra-solar planets" (PDF). Astronomy and Astrophysics. 469 (3): L43. arXiv:0704.3841. Bibcode:2007A&A...469L..43U. doi:10.1051/0004-6361:20077612. Archived from the original (PDF) on October 8, 2010. ^ From "Kepler: About the Mission". NASA. "The Kepler Mission, NASA Discovery mission #10, is specifically designed to survey a portion of our region of the Milky Way galaxy to discover dozens of Earth-size planets in or near the habitable zone and determine how many of the billions of stars in our galaxy have such planets." ^ Bracewell, R. N. (1960). "Communications from Superior Galactic Communities". Nature. 186 (4726): 670–671. Bibcode:1960Natur.186..670B. doi:10.1038/186670a0. ^ Papagiannis, M. D. (1978). "Are We all Alone, or could They be in the Asteroid Belt?". Quarterly Journal of the Royal Astronomical Society. 19: 277–281. Bibcode:1978QJRAS..19..277P. ^ Robert A. Freitas Jr. (November 1983). "Extraterrestrial Intelligence in the Solar System: Resolving the Fermi Paradox". Journal Of The British Interplanetary Society. 36. pp. 496–500. Bibcode:1983JBIS...36..496F. ^ Freitas, Robert A Jr; Valdes, F (1985). "The search for extraterrestrial artifacts (SETA)". Acta Astronautica. 12 (12): 1027–1034. Bibcode:1985AcAau..12.1027F. CiteSeerX 10.1.1.118.4668. doi:10.1016/0094-5765(85)90031-1. Retrieved August 19, 2010. ^ Dyson, Freeman J. (1960). "Search for Artificial Stellar Sources of Infra-Red Radiation". Science. 131 (3414): 1667–1668. Bibcode:1960Sci...131.1667D. doi:10.1126/science.131.3414.1667. PMID 17780673. ^ a b Wright, J. T.; Mullan, B.; Sigurðsson, S.; Povich, M. S. (2014). "The Ĝ Infrared Search for Extraterrestrial Civilizations with Large Energy Supplies. I. Background and Justification". The Astrophysical Journal. 792 (1): 26. arXiv:1408.1133. Bibcode:2014ApJ...792...26W. doi:10.1088/0004-637X/792/1/26. ^ a b Wright, J. T.; Griffith, R.; Sigurðsson, S.; Povich, M. S.; Mullan, B. (2014). "The Ĝ Infrared Search for Extraterrestrial Civilizations with Large Energy Supplies. II. Framework, Strategy, and First Result". The Astrophysical Journal. 792 (1): 27. arXiv:1408.1134. Bibcode:2014ApJ...792...27W. doi:10.1088/0004-637X/792/1/27. 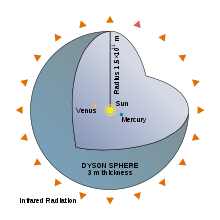 ^ "Fermilab Dyson Sphere search program". 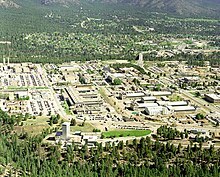 Fermi National Accelerator Laboratory. Retrieved February 10, 2008. ^ Wright, J. T.; Mullan, B; Sigurdsson, S; Povich, M. S (2014). "The Ĝ Infrared Search for Extraterrestrial Civilizations with Large Energy Supplies. III. The Reddest Extended Sources in WISE". The Astrophysical Journal Supplement Series. 217 (2): 25. arXiv:1504.03418. Bibcode:2015ApJS..217...25G. doi:10.1088/0067-0049/217/2/25. ^ "Alien Supercivilizations Absent from 100,000 Nearby Galaxies". Scientific American. April 17, 2015. ^ Andersen, Ross (October 13, 2015). "The Most Mysterious Star in Our Galaxy". The Atlantic. Retrieved October 13, 2015. ^ Williams, Lee (October 15, 2015). "Astronomers may have found giant alien 'megastructures' orbiting star near the Milky Way". The Independent. Retrieved October 15, 2015. ^ Overbye, Dennis (January 10, 2018). "Magnetic Secrets of Mysterious Radio Bursts in a Faraway Galaxy". The New York Times. Retrieved April 2, 2019. ^ Ward, Peter D.; Brownlee, Donald (January 14, 2000). Rare Earth: Why Complex Life is Uncommon in the Universe (1st ed.). Springer. p. 368. ISBN 978-0-387-98701-9. ^ The Nature of Nature: Examining the Role of Naturalism in Science, editors Bruce Gordon and William Dembski, Ch. 20 "The Chain of Accidents and the Rule of Law: The Role of Contingency and Necessity in Evolution" by Michael Shemer, published by Intercollegiate Studies Institute, 2010. ^ Lineweaver, Charles H (2008). Paleontological tests: human-like intelligence is not a convergent feature of evolution. From fossils to astrobiology. Springer. pp. 353–368. arXiv:0711.1751. Bibcode:2007arXiv0711.1751L. ^ Steven V. W. Beckwith (2008). "Detecting Life-bearing Extrasolar Planets with Space Telescopes". The Astrophysical Journal. 684 (2): 1404–1415. arXiv:0710.1444. Bibcode:2008ApJ...684.1404B. doi:10.1086/590466. ^ Sparks, W.B. ; Hough, J.; Germer, T.A. ; Chen, F.; DasSarma, S.; DasSarma, P.; Robb, F.T. ; Manset, N.; Kolokolova, L.; Reid, N.; et al. (2009). "Detection of circular polarization in light scattered from photosynthetic microbes" (PDF). Proceedings of the National Academy of Sciences. 106 (14–16): 1771–1779. doi:10.1016/j.jqsrt.2009.02.028. ^ a b Tarter, Jill (2006). "What is SETI?". Annals of the New York Academy of Sciences. 950 (1): 269–75. Bibcode:2001NYASA.950..269T. doi:10.1111/j.1749-6632.2001.tb02144.x. PMID 11797755. ^ Abraham Loeb (January 8, 2018). "Are Alien Civilizations Technologically Advanced?". Scientific American. ^ "The Intelligent-Life Lottery". The New York Times. August 18, 2014. ^ a b Why David Brin Hates Yoda, Loves Radical Transparency, Wired interview, August 8, 2012. ^ Webb, 2nd edition, 2015, Chapters 36–39. ^ "Mirror-image cells could transform science – or kill us all". WIRED. November 11, 2010. ^ "Is a Climate Disaster Inevitable?". The New York Times. January 17, 2015. ^ Bostrom, Nick. "Existential Risks Analyzing Human Extinction Scenarios and Related Hazards". Retrieved October 4, 2009. ^ Sagan, Carl. "Cosmic Search Vol. 1 No. 2". Cosmic Search Magazine. Retrieved July 21, 2015. ^ Hawking, Stephen. "Life in the Universe". Public Lectures. University of Cambridge. Archived from the original on April 21, 2006. Retrieved May 11, 2006. ^ "The Great Silence: the Controversy . . " (15-page paper), Quarterly J. Royal Astron. Soc., David Brin, 1983, page 296 bottom third. ^ Soter, Steven (2005). "SETI and the Cosmic Quarantine Hypothesis". Astrobiology Magazine. Space.com. Retrieved May 3, 2006. ^ Archer, Michael (1989). "Slime Monsters Will Be Human Too". Aust. Nat. Hist. 22: 546–547. ^ Alexander Berezin (March 20, 2018). ""First in, last out" solution to the Fermi Paradox". arXiv:1803.08425 [physics.pop-ph]. 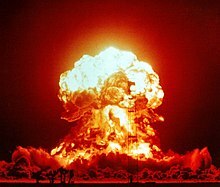 ^ "Scientist predicts our future will be 'worse than extinction'". RT.com. May 30, 2018. ^ Peter Dockrill (May 29, 2018). "A Physicist Has Proposed a Grim Explanation For Why We Never See Aliens". Sciencealert.com. ^ "The Aliens Are Silent Because They Are Extinct". Australian National University. January 21, 2016. Retrieved January 22, 2016. ^ Melott AL, Lieberman BS, Laird CM, Martin LD, Medvedev MV, Thomas BC, Cannizzo JK, Gehrels N, Jackman CH (2004). "Did a gamma-ray burst initiate the late Ordovician mass extinction?" (PDF). International Journal of Astrobiology. 3 (1): 55–61. arXiv:astro-ph/0309415. Bibcode:2004IJAsB...3...55M. doi:10.1017/S1473550404001910. hdl:1808/9204. ^ Nick Bostrom; Milan M. Ćirković. "12.5: The Fermi Paradox and Mass Extinctions". Global catastrophic risks. ^ Loria, Kevin (June 25, 2018). "There's a compelling explanation for why we've never found aliens — and it could mean humanity is doomed". Business Insider. Retrieved June 25, 2018. ^ Guth, Alan (2007). "Eternal Inflation and its Implications" (PDF). Journal of Physics A: Mathematical and Theoretical. 40 (25): 6811–6826. arXiv:hep-th/0702178. Bibcode:2007JPhA...40.6811G. doi:10.1088/1751-8113/40/25/S25. ^ Vakoch, Douglas (November 15, 2001). "Decoding E.T. : Ancient Tongues Point Way To Learning Alien Languages". SETI Institute. Archived from the original on May 23, 2009. Retrieved August 19, 2010. ^ Adam Stevens; Duncan Forgan; Jack O'Malley James (2015). "Observational Signatures of Self–Destructive Civilisations". arXiv:1507.08530 [astro-ph.EP]. ^ Newman, W.T. ; Sagan, C. (1981). "Galactic civilizations: Population. dynamics and interstellar diffusion". Icarus. 46 (3): 293–327. Bibcode:1981Icar...46..293N. doi:10.1016/0019-1035(81)90135-4. hdl:2060/19790011801. ^ a b "The Great Silence: the Controversy . . " (15-page paper), Quart. Journ. Royal Astronomical Soc., David Brin, 1983, page 287, sixth paragraph, "Equilibrium is another concept which weaves through the new SETI debate . . . ", as well as page 298, third paragraph, "Newman & Sagan (4) have suggested that population pressure is not . . . ". ^ a b Landis, Geoffrey (1998). "The Fermi Paradox: An Approach Based on Percolation Theory". Journal of the British Interplanetary Society. 51: 163–166. Bibcode:1998JBIS...51..163L. ^ a b "The Great Silence: the Controversy Concerning Extraterrestrial Intelligent Life" (15-page paper), Quarterly J. Royal Astron. Soc., David Brin, 1983, page 300 " . . abandonment of planet-dwelling . . ". ^ Scheffer, L.K. (1994). "Machine Intelligence, the Cost of Interstellar Travel and Fermi's Paradox". Quarterly Journal of the Royal Astronomical Society. 35: 157. Bibcode:1994QJRAS..35..157S. ^ Seth D. Baum; Jacob D. Haqq-Misra; Shawn D. Domagal-Goldman (2011). "Would contact with extraterrestrials benefit or harm humanity? A scenario analysis" (PDF). Acta Astronautica. 68 (11): 2114–2129. arXiv:1104.4462. Bibcode:2011AcAau..68.2114B. CiteSeerX 10.1.1.592.1341. doi:10.1016/j.actaastro.2010.10.012. "If ETI search for us just as we search for them, i.e. by scanning the sky at radio and optical wavelengths [...] the radiation that has been unintentionally leaking and intentionally transmitted from Earth may have already alerted any nearby ETI to our presence and may eventually alert more distant ETI. Once ETI become alerted to our presence, it will take at least as many years for us to realize that they know." ^ Turnbull, Margaret C.; Tarter, Jill C. (2003). "Target Selection for SETI. I. A Catalog of Nearby Habitable Stellar Systems" (PDF). The Astrophysical Journal Supplement Series. 145 (1): 181–198. arXiv:astro-ph/0210675. Bibcode:2003ApJS..145..181T. doi:10.1086/345779. Retrieved August 19, 2010. ^ The Staff at the National Astronomy and Ionosphere Center (December 1975). "The Arecibo message of November, 1974". Icarus. 26 (4): 462–466. Bibcode:1975Icar...26..462.. doi:10.1016/0019-1035(75)90116-5. "A radio telescope in M13 operating at the transmission frequency, and pointed toward the Sun at the time the message arrives at the receiving site will observe a flux density from the message which will exceed the flux density of the Sun itself by a factor of roughly 107. Indeed, at that unique time, the Sun will appear to the receptors to be by far the brightest star of the Milky Way." ^ Marko Horvat (2007). "Calculating the probability of detecting radio signals from alien civilizations". International Journal of Astrobiology. 5 (2): 143–149. arXiv:0707.0011. Bibcode:2006IJAsB...5..143H. doi:10.1017/S1473550406003004. "There is a specific time interval during which an alien civilization uses radio communications. Before this interval, radio is beyond the civilization's technical reach, and after this interval radio will be considered obsolete." ^ Stephenson, D. G. (1984). "Solar Power Satellites as Interstellar Beacons". Quarterly Journal of the Royal Astronomical Society. 25 (1): 80. Bibcode:1984QJRAS..25...80S. ^ "Cosmic Search Vol. 1 No. 3". Bigear.org. September 21, 2004. Retrieved July 3, 2010. ^ Learned, J; Pakvasa, S; Zee, A (2009). "Galactic neutrino communication". Physics Letters B. 671 (1): 15–19. arXiv:0805.2429. Bibcode:2009PhLB..671...15L. doi:10.1016/j.physletb.2008.11.057. ^ Bostrom, Nick (April 22, 2008). "Where Are They?". MIT Technology Review. Retrieved June 21, 2015. ^ Webb, Chapter 15: "They Stay at Home and Surf the Web"
^ Beyond “Fermi’s Paradox” II: Questioning the Hart-Tipler Conjecture (middle of page), Universe Today, April 8, 2015. ^ If the Universe Is Teeming..., Stephen Webb, page 28. ^ Schombert, James. "Fermi's paradox (i.e. Where are they?)" Cosmology Lectures, University of Oregon. ^ Hamming, RW (1998). "Mathematics on a distant planet". The American Mathematical Monthly. 105 (7): 640–650. doi:10.2307/2589247. JSTOR 2589247. ^ Istvan, Zoltan (March 16, 2016). "Why Haven't We Met Aliens Yet? Because They've Evolved into AI". Motherboard. Vice Media. Archived from the original on December 30, 2017. Retrieved December 30, 2017. ^ Long, K. F. (November 25, 2011). Deep Space Propulsion: A Roadmap to Interstellar Flight. p. 114. ISBN 978-1-4614-0607-5. Retrieved June 23, 2015. ^ Cook, Stephen P. (October 29, 2012). "SETI: Assessing Imaginative Proposals". Life on Earth and other Planetary Bodies. p. 54. ISBN 978-94-007-4966-5. ^ a b Webb, Stephen (May 18, 2015). If the Universe Is Teeming with Aliens … WHERE IS EVERYBODY? : Fifty Solutions to the Fermi Paradox and the Problem of Extraterrestrial Life. ISBN 978-0-387-95501-8. Retrieved June 21, 2015. ^ Alexander Zaitsev (2006). "The SETI paradox". arXiv:physics/0611283. ^ "Should We Call the Cosmos Seeking ET? Or Is That Risky?". The New York Times. February 13, 2015. ^ "Declaration of Principles Concerning Activities Following the Detection of Extraterrestrial Intelligence". ^ Michaud, M. (2003). "Ten decisions that could shake the world". Space Policy. 19 (2): 131–950. doi:10.1016/S0265-9646(03)00019-5. ^ Ball, J (1973). "The zoo hypothesis". Icarus. 19 (3): 347–349. Bibcode:1973Icar...19..347B. doi:10.1016/0019-1035(73)90111-5. ^ Hair, Thomas W. (February 25, 2011). "Temporal dispersion of the emergence of intelligence: an inter-arrival time analysis". International Journal of Astrobiology. 10 (2): 131–135. Bibcode:2011IJAsB..10..131H. doi:10.1017/S1473550411000024. ^ Tough, Allen (1986). "What Role Will Extraterrestrials Play in Humanity's Future?" (PDF). Journal of the British Interplanetary Society. 39 (11): 492–498. Bibcode:1986JBIS...39..491T. ^ Baxter, Stephen (2001). "The Planetarium Hypothesis: A Resolution of the Fermi Paradox". Journal of the British Interplanetary Society. 54 (5/6): 210–216. Bibcode:2001JBIS...54..210B. ^ Carrigan, Richard A. (2006). "Do potential SETI signals need to be decontaminated?". Acta Astronautica. 58 (2): 112–117. Bibcode:2006AcAau..58..112C. doi:10.1016/j.actaastro.2005.05.004. ^ Marsden, P. (1998). "Memetics and social contagion: Two sides of the same coin". Journal of Memetics-Evolutionary Models of Information Transmission. 2 (2): 171–185. ^ Beatriz Gato-Rivera (1970). "A Solution to the Fermi Paradox: The Solar System, Part of a Galactic Hypercivilization?". arXiv:physics/0512062. ^ Ray Villard (August 10, 2012). "Why Do People Believe in UFOs?". Discovery News. ^ Paul Speigel (October 18, 2012). "More Believe in Space Aliens Than in God According To U.K. Survey". Huffington Post. ^ Shermer, Michael (2011). "UFOs, UAPs and CRAPs". Scientific American. 304 (4): 90. Bibcode:2011SciAm.304d..90S. doi:10.1038/scientificamerican0411-90. PMID 21495489. ^ A. Tough (1990). "A critical examination of factors that might encourage secrecy". Acta Astronautica. 21 (21): 97–102. Bibcode:1990AcAau..21...97T. doi:10.1016/0094-5765(90)90134-7. ^ Ashlee Vance (July 31, 2006). "SETI urged to fess up over alien signals". The Register. ^ "UFO Hunters Keep Pressing White House For Answers Through 'We The People' Petitions". The Huffington Post. December 6, 2011. ^ G. Seth Shostak (2009). Confessions of an Alien Hunter: A Scientist's Search for Extraterrestrial Intelligence. National Geographic. ISBN 978-1-4262-0392-3. Page 17. ^ "The Great Silence: the Controversy . . " (15-page paper), Quarterly J. Royal Astron. Soc., David Brin, 1983, page 299 bottom. Allora; Calzadilla; Ted Chiang (May 8, 2015). "The Great Silence". 56th Biennial – Planetary Computing (Is the Universe Actually a Gigantic Computer?) – via e-flux journal. Zuckerman, Ben; Hart, Michael H. (September 28, 1995). Extraterrestrials: Where Are They?. ISBN 978-0-521-44803-1.